Safco Tabletop Lectern, 24w x 20d x 13-1/2h, Mahogany/Black - Use lectern on a tabletop or with the Safco Lectern/Media stand (sold separately). 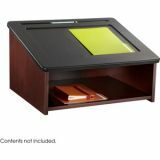 Speaker platform has a 19 wide x 13" deep recessed area to hold papers in place and a pencil groove for writing utensils. With lectern/media stand, tabletop lectern creates a 45" high mobile lectern with storage. 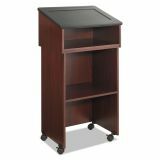 When used alone, it is a mobile media stand for TV/VCR or projector. 3/4" furniture-grade wood has a stain-resistant and scratch-resistant laminate finish. 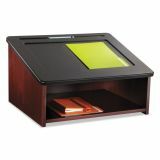 Lectern contains a high percentage of recycled material." Soft rubber pads protect table surfaces. 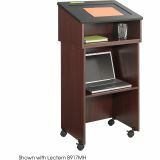 Use alone on table surface or in combination with Lectern Base/Media Cart (sold separately) to create a 45" mobile lectern with storage. Fold down platform for easy user visibility.